The weekly grocery fliers arrived yesterday, and when I saw the QFC ad for ‘Fresh Wild Coho Salmon’ I was reminded of a frequent shopping dilemma: should I buy whole fish or fillets? This week’s offering is $9.99 for the fillets, or $6.99 for the whole fish. I have no idea which price is the better deal. I know that most groceries and markets will fillet your whole fish for free, but once you get rid of head, tail, fins, skin, and bones, how much are you really paying per pound for the fish that remains? According to the New York Times, “flat fish like gray sole can lose as much as two-thirds of their weight after they are filleted”. The food encyclopedia Practically Edible tells us that “when buying a whole fish, allow 1 pound per person (450g); when buying fillets [or steaks], allow 1/4 to 1/2 pound per person (110 to 225g).” From this we can infer 50-75% waste. Fannie Farmer’s 1918 Boston Cooking-School Cook Book includes a table titled ‘Composition of the Various Fish Used for Food’. The first column shows ‘Refuse’ in percents. Most whole fish contain between 40 and 55 percent waste, with a couple of outliers (including flounder, aka ‘sole’) in the low 60s. So when you’re standing at the market wondering what to buy, a 1:2 ratio would make a good rule of thumb. This means that whole fish need to be half the price of pre-cut fillets or steaks to break even. If you want to do advance calculations for a particular type of fish, the Fannie Farmer fish table will give you the most accurate answer. Salmon, to return to my initial example, typically has 39.2% waste. A 10-pound fish at $6.99/pound would cost (rounding) $70 and net me just over 6 edible pounds. Cost per pound, about $11.50 — not a bargain when pre-cut fillets are $9.99. One other factor to note: fish stay fresh longer when they’re whole rather than cut. So all else being equal, go for the whole fish and have it cut on the spot. hey, neat! I always wondered about that too and had no idea how to figure it out. I tend to make my decision based on where I am getting the fish. If I like the way the place cleans and fillets the fish, then I pay for the whole fish. If I don’t like their on-the-spot method, I pay for the filleted fish. But then, I also take the head, so I don’t lose too much of the weight. But it’s nice to know what the actual loss ratio is. Thanks so much for this information. I have been looking all over for this type of information. 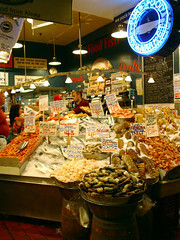 We eat a lot of fish, especially whole fish, and have always wondered how much fish we are *really* buying and eating. The link to the table is particularly helpful. You might also want to factor in whether you can make use of any of that waste. Many Bouillabaisse recipes use fish heads and/or skeletons to make the fish stock. Sort of like buying whole chickens — if you’re going to make stock with the carcass, you’re getting some use out of the bones. If not, then there’s more wastage. Personally, I get the Costco rotisserie chickens and $4.99 and break them down (4-8 slices, some joint splitting and a little prying) and roast the bones with celery, carrot and onion ans then dump it in and instant pot along with 8 cups water, a pair of fresh bay leave (off one of my plants) and thyme, a leaf of fresh sage and a twig or two of fresh savory for 30 minutes. Meanwhile I got the meat for using. I usually eat the thighs and use the breasts in recipes after slicing off a taste. BAS: glad it was helpful! This is fantastic, I’ve often wondered if the price was actually inflated. My roommate always buys skinless boneless chicken and I have no idea how to tell if this is a good deal or not. (It’s hard to argue, however, because he gets a discount for being friends with the guy behind the counter). Hello, I am a Fishmonger at a high end store. I have had people as me the question on this matter many times. You are correct though it all depends on whether the customer plans on using the entire carcass say for soup or stock. However there are some fish such as your common mackerel or bluefish which unless you are an eastern European might think of as bad or trash fish. These however are some of the best fish to use in soups or stock because of their high oil content. These however will cost you a lot more to buy just the fillet so buying the whole fish is your best way of going. Most fish markets I know including the one I work at can and will fillet your purchase in house at no extra cost and bag your bones separately. Enjoy your seafood! $6.99 vs $9.99 depends in the species since some have thicker skin which you are still paying for. $5.99 would be a bargain difference. Personally, I most use Salmon. It the magical fish since it is really 6 or 7 fish. 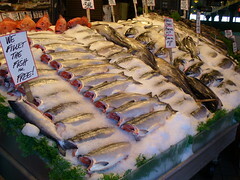 The way to prepare King (Chinook) Salmon is complete different from a Sockeye from a Silver (Coho). Chum is only good for bait. Trout is also a Salmon and the delicious but requires preparations well. However, Rainbow trout can be prepared virtually the same as regular trout be with a slightly less intense sauce to let the flavor shine. Personally, I just use tarragon and or chervil butter on Coho since it so lush in flavor and save the more inventive recipes for Sockeye which has a less complex but strong flavor that hold up to sauces like tomato basil, etc. Jesse bring up a point, often they are willing to debone for you in order to sell a whole fish quantity versus just a single piece and will gladly give you the bones since they have no use for them. Personally, I do not make fish stock, not from the bones anyway but I have from poaching Salmon, unlike with Chicken where I make stock regularly. P.S. – If you plan to make chicken stock regularly get an Instant Pot. It is fraction of the work and the results are perfect in about an hour compared to boiling for 2 – 3 hours. Double exposure: risks of working in the financial industry » « Cutting benefits to lure employees?